August 25 – How do you portray a saint? The following text is taken from an informal lecture Professor Plinio Corrêa de Oliveira gave on August 25, 1964. It has been translated and adapted for publication without his revision. –Ed. August 25 is the feast of Saint Louis IX, king, confessor of the Faith, Crusader and model of a Catholic head of state. There are two different ways people picture Saint Louis IX. One is as he truly was, the other is a soft, effeminate distortion of his person. This dichotomy is similar to the one that exists between many artists’ renditions of Saint Pius X and pictures of him. On the one hand, the photographs portray a giant of a man, strong soul and spiritual king, conscious of his dignity. On the other hand, many artists depict a feeble old grandfather, whose face begs pardon for being pope and regrets that he is not a simple priest. There is an abyss between this limp-wristed portrayal and the historic Saint Pius X, who was the hero against Modernism. 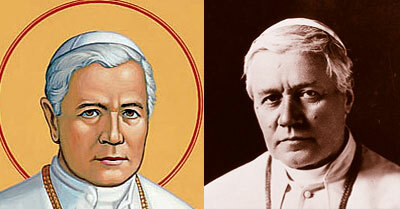 Many artists’ renditions of Saint Pius X portray a limp-wristed distortion of his person as seen in photographs. The same holds true with Saint Louis IX. On one hand, he is portrayed distributing justice under the famous oak tree in Vincennes, like a king that lived under the trees and preferred to sit around rather than lead the life of the castle, administrate the affairs of state and wage wars amid the pomp and ceremonial incumbent on the first kingdom of Christendom. In these portrayals, he softly sits in judgment, certainly pardoning everyone and only dealing with simple things that do not require shrewdness, ingenuity or force of will. This has become the preponderant image of Saint Louis IX. The peasants who surround him are infected with the same softness. By association, the whole medieval world is portrayed in a clownish way, consisting of soft kings, surrounded by mountains of softness. Likewise, many paintings of Saint Louis IX show a soft weakling that contradicts the historic reality of who he was and are in sharp contrast to other more realistic portrayals. The enemies of Christian civilization skillfully use this representation to denigrate the kings who succeeded Saint Louis. “He was good because he was simple,” they say, “he just sat under his tree and judged.” Thus, they present Louis XIV in his glory at Versailles, surrounded by beauty and pomp, as something intrinsically wrong. To repel this false image, it is good to remember the real Saint Louis IX, who was both a statesman and Crusader. Saint Louis IX was king of an organic monarchy. He was not a hands-off ruler who abandoned state affairs to his vassals, but rather one who knew his rights and responsibilities, and was protective of them. 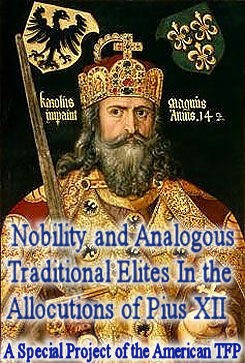 When his vassals sought to confront or diminish his authority, he resisted them to maintain royal power. Although it would have been easier for him to give the command directly as king, his respect for feudal customs and all degrees of hierarchy would not allow him to interfere with the local governance. Out of love for the organic nature of society, he scrupulously maintained the feudal structure. In this, he was very different from later French kings, like Louis XVI, Louis XIII, Henry IV and even Louis XI, who systematically destroyed that same structure. Saint Louis also protected the guilds and made them assent to a rule drafted from custom-based directives. 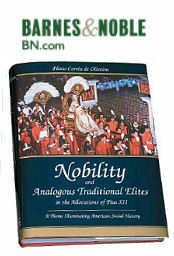 This gave structure to these autonomous organizations. Thus, while supporting every legitimate independent power in his kingdom, he remained its gravitational center. Saint Louis even defended his royal power against the Holy See. He confronted the Vatican for interfering in the strictly temporal affairs of France, pressing the issue until it retreated. When this was studied during the process for his canonization, he was vindicated. 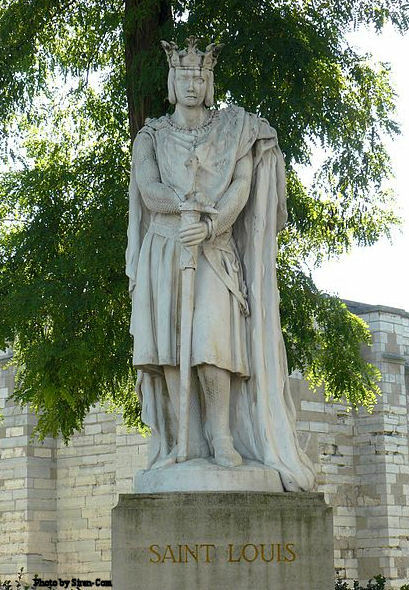 As a warrior, Saint Louis fought on two Crusades and died of pestilence in Tunis. Sick and bedridden, he died defeated and tearful, while the whole world had pity on him. This sad story is historic, but not complete. Saint Louis was also the king described by Joinville, who departed for the Crusades in all his magnificence, dominating his whole army and vested from head to foot in brilliant golden armor. When his boat first approached the Egyptian coast, his enthusiasm was such that he could not wait for the vessel to touch land. He threw himself, fully armed, into the sea and ran ashore to press the attack, before his men reached land. This and other actions have immortalized him as a perfect warrior. This image must be considered together with the image of the wounded soldier, sick and suffering, who became venerable by imitating the Passion of Our Lord Jesus Christ. 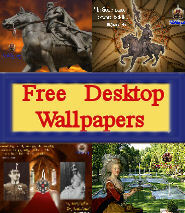 Only the combination of all these aspects can give an adequate image of King Saint Louis IX. 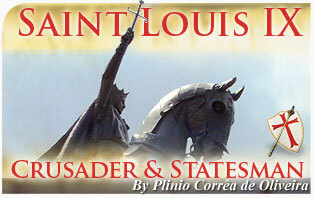 As a model statesman and Crusader, Saint Louis was loved and even venerated by his people. There is touching evidence of this. Though medieval coins are rare, the most common of all are those minted during the reign of Saint Louis. Since his effigy was on these coins, his people kept them as a medallion and remembrance of his reign. They guarded these coins so carefully, that many have survived. These outnumber all other coins of the epoch. This demonstrates how a truly virtuous leader lifts his people up with him. There is a beautiful prayer written to Saint Louis by Constable Du Guesclin, one of Saint Joan of Arc’s companions-in-arms. Though written years after Saint Louis’ death, it gives an idea of how great he was. Keep me pure as the lily engraved on your coat of arms, O thou who kept thy word even when given to the Infidel. Never allow a lie to pass my lips, even should frankness cost me my life. Man of prowess, incapable of retreat, burn the bridges that lead to my excuses, so that I will always advance towards the most arduous part of the battle. 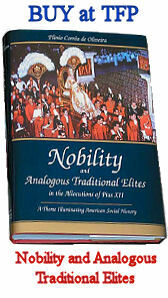 Previous post: Think nobles are expensive?